With so many MOBAs, FPSs, and MMOs out there vying for attention it becomes almost too easy to miss a title that fills a niche otherwise unoccupied by anything else. 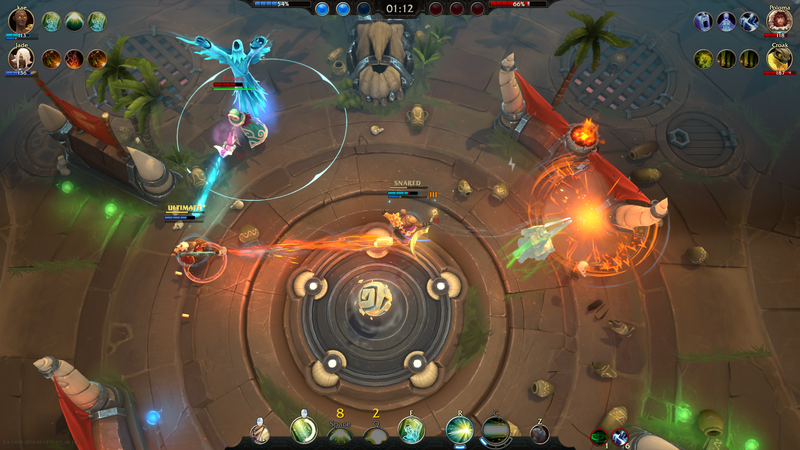 Battlerite is exactly one of those titles that falls between a couple of genres and game types, but this is one you will not want to miss if you’re a fan of competitive MOBAs or the older format of arena combat games. If you’re someone who’s been into the arena PvP genre of games for a few years then you may already know of its predecessor: Bloodline Champions. During a time where World of Warcraft was the dominant force in MMOs, and popular competitive gaming was limited to StarCraft and Counter Strike as the pioneers of the eSports scene, Bloodline appeared with next to no fanfare – at least not the amount that it deserved. It took WoW’s Arena mode – which was a PvP brawl inside a small enclosed space with teams of two, three, or five – where absolutely no holds were barred and stripped away the plethora of abilities that a WoW class had available. If you’re familiar with other MOBAs like League of Legends, Dota 2, or Heroes of the Storm, this game should be a little easier to grasp and understand. 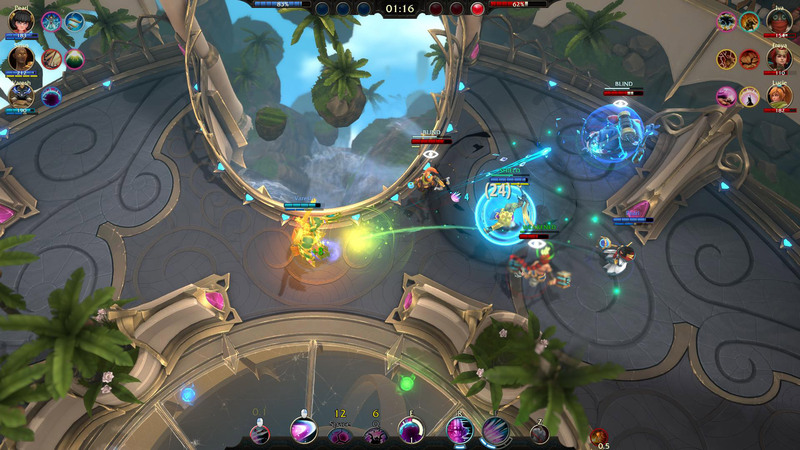 A lot of the ideas driving its design takes inspiration from the traditional MOBA style. What it does differently, however, and something that I find to be one of its biggest advantages over other MOBAs, is that Battlerite strips away all the fat and pares down to the absolute core: conflict. There is no laning phase, minion and creep farming, no gold, no items to purchase mid-game, and no sprawling maps with multiple paths, lanes, and points of attack. Conflict is not simply an eventual inevitability; it’s an instant requirement. Another difference from WoW Arena or MOBAs that many players will try to compare it to is that this game is entirely based on skill. Every ability that is not cast on you or a team mate (and even some of those, too) are skillshots. For those of you who aren’t familiar with the lingo of MOBAs, this term simply means that you have to aim your abilities with your mouse and the chance to miss a crucial skill – especially when under an incredible amount of pressure and pumping with adrenaline – is always a very real thing. For me this only adds to the appeal of Battlerite because it separated players based on their mastery of the characters, knowledge of their enemies, and their reactions to combinations of attacks or team compositions. As a game starts, you’re sat inside a small fenced pen awaiting all allies and enemies to set themselves as ready, at which point the pen you’re in will move toward the arena like an elevator pulling Russel Crowe into the sunlight of a Gladiator arena. It adds an air of tension as you stand with your team mates waiting for the gates to open and the battle to commence. Each map contains a single point of contest at the very centre that draws everyone in, because it’s an area that you will really want to control or, at the very least, contest. At this centre is a small orb-shaped rune that will spawn after a time with a limited amount of health. The team that scores the last hit and destroys the orb will receive health and energy to give them the edge over their opponents, starting the timer for the next orb to spawn. The maps are also very small. Not small enough that it becomes a clustered brawl and negates the usefulness of ranged characters, but enough that even those types of characters will need to remain active and keep moving so as to not be squished by a melee champion. Mastery of the characters is something that I found immensely satisfying despite it also being the same level of challenge and difficulty that you’d find in a top-tier arcade fighting game. Each character has seven abilities that they can use, with a couple of those having the option of being modifiable with the Shift key. The structure of characters is generally very similar in the sense that they all have a basic attack with the left mouse button, some form of dodge, a defensive skill, a status effect skill, a large attack or boon for allies, and their Ultimate. This seems like a lot to take in, but most of the characters have similar effects or types of situation abilities on the same keys, so switching to a new character isn’t as big a learning curve as perhaps Dota or League might be. The tricky part comes when learning the granular effects of those skills, the combo potential they can provide both with your other abilities or allies, and the modifiable effect that happens when the Shift key is held simultaneously. Basic attacks and abilities, picking up the dropped ‘remains’ of your allies, or power-ups around the centre of the map will help toward gaining energy, as will destroying the run orb in the centre. 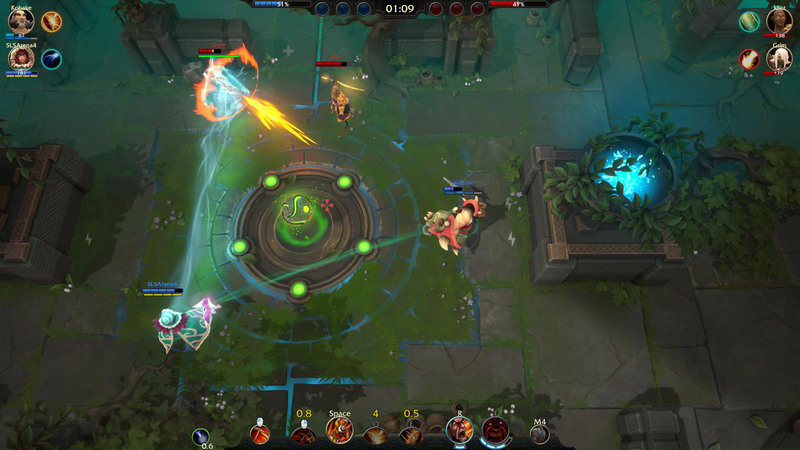 This is where Battlerite becomes somewhat akin to an arcade fighting game. Energy works similar to the EX gauge in Street Fighter where using a Shift-modified ability or the R ability for the character will expend chunks of that energy, pulling you further from using your Ultimate ability. Your ultimate, however, will require and expend the entirety of your Energy in one fell swoop. It becomes a balancing act of strategy whether or not you spend some of that energy or wait it out for the Ultimate. Alongside the abilities, you are able to customise each of your characters’ loadouts with Rites. These are essentially cards that alter the way certain abilities work much like Masteries in LoL, or the talent system in WoW. These are aspects of the character that you will get require time to perfect because you first need to get used to how a character works before you’re able to make an assessment of how to augment their skills. For example, you can extend the duration of a status effect, add a life-steal/healing effect to your basic attacks, or make your Ultimate Ability do something extra at the cost of damage. This, other aspects of the game, is down to personal preference. There may well be optimal setups that people will swear by, but I found great pleasure in tweaking these to fit my own personal play style. Personally, I like increasing slow effects to give my team mates a better chance of landing that huge attack, or adding a rooting effect when enemies pass through my shield on the new character: Destiny. It would be remiss of me to not mention the dreaded loot boxes found in the game, though. Let us not get political on this and drop subjective opinions on the whole system, because that has no relevance to this review. What’s important to note is that there are a number of ways to earn loot boxes within the game from regular quests and objectives, completing achievements, or simply levelling up. Also running through the tutorial will net you a decent amount of the Silver Chests. Overall, this system in place is an acceptable one that doesn’t feel so intrusive. It’s cosmetics, it can be earned in-game, and it’s there as an additional way for the developers and publishers to make an additional income. It does not take away from the enjoyment of the game whatsoever, so don’t let that mar your judgment! Battlerite is an absolute corker of a game. I’ve played my share of MOBAs old and new with most of my time has been put into League of Legends and Overwatch, so it’s no small feat for a game to waltz onto the scene and completely capture me. Battlerite does things right on so many levels that it’s hard to ignore. Games are fast, frenetic, packed with only the greatest moments of League or Dota without slogging through the 20-30 minutes of ‘filler’ gameplay like farming, pushing lanes, and so forth. It carves out the high intensity combat from those games, gives it the skill-based aiming and movement of a FPS, and packages it beautifully together. Champions are varied and interesting with most, if not all, of them being represented as the most played by the top 50 players in the world. In a market where League or Overwatch having their flavour of the month characters and metas that contain a very small selection of the total characters available, this is an incredibly refreshing change. It speaks highly of the game’s balance. Every champion has been fun to play and have their place in the arena, with not a one of them being left behind… so long as you know how to play them! 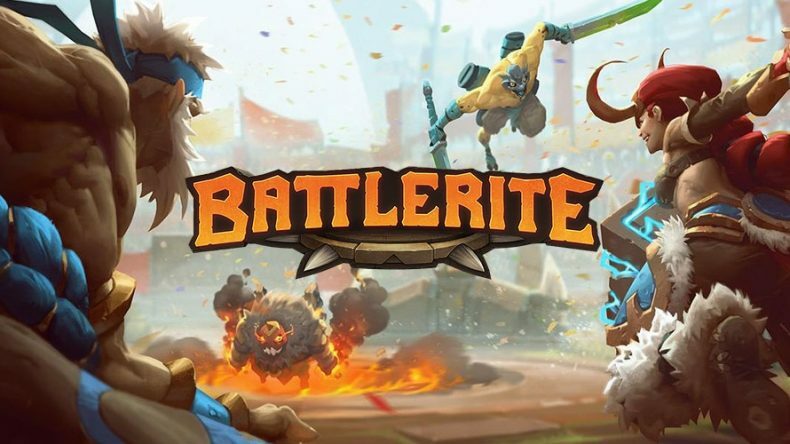 If you’re interested in competitive gaming and really need something new to sink your teeth into, you do not need to look any further than Battlerite. Balanced, fun characters, unobtrusive monetisation, and refined to give the core experience of competitive gaming. Battlerite is exceptionally good.